Are you feeling reluctant to create New Year’s Resolutions? I don’t blame you. In fact, I am not a big fan or New Year’s Resolutions. History shows that the vast majority of resolutions fail. So let’s skip the resolutions that are bound to fail and instead focus on some healthy habits you can actually keep and make good on from January all the way to December 31. OK, so maybe not the best sounding promise, but if you like seafood this promise doesn’t even take will power. All it takes is modifying your grocery list by buying fish on occasion. Enjoy fish for dinner once a week, and you’ll protect your heart from disease and increase your chances for a longer life. Go with salmon, trout, flounder, or tuna. Just make sure to avoid seafood with high traces of mercury. Not the wet, soapy kind of lathering up (although I hope you do that too). You want your skin to look young and healthy, so this is the year you do something about it. If you refuse to cover up or stay in the shade, make sure you keep a bottle of sunscreen on your counter. When getting ready for your day, make it part of your routine to spread some sun-shielding lotion on your face, arms, and neck. It’ll save your skin so it’ll look its best in years to come and prevent skin cancer. Just make sure to avoid sunscreens with toxic ingredients. In today’s world, it can be difficult to find the time to exercise. One way to increase your odds for exercising each day is to knock it out first thing in the morning. This year, resolve to exercise right after waking up. Adjust your wake up time to accommodate your morning sweat session. Don’t let yourself fall for the “no time” excuse, the proper 20 minute workout, even done from home with no equipment, can yield much better results than running for an hour. Know that triathlon or marathon you’ve been considering? Want to stop feeling the need to eat cake at every birthday party you attend—even when the cake is dry? This is the year you train properly for that event, say no to cake on occasion, and take up mountain climbing. Find someone with the same goal, make a plan to reach the goal, and get started. Once you complete your first goal and see that it wasn’t as impossible as you once thought, you may just find yourself setting even bigger goals for next year. Try something different and make sure you have someone to hold you accountable. Your body is primarily made up of water. Keep it that way by skipping soda and sipping on water all day long. 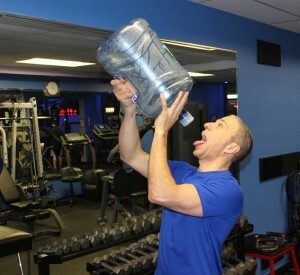 A great way to make strides toward your watery goal is to fill up the biggest water bottle you can find and go at it. Preferably, you can drink from something that holds 2.2 liters (9 cups), as all you’ll need is a single fill up in the morning to stay hydrated all day long. Here’s my favorite. One of the best ways to avoid injury, as we age, is to take a few minutes to stretch daily. This is most effectively done after you’ve worked out. By taking the best care of your muscles, with stretching, you’ll avoid taking time off for injury recovery and will be able to accomplish your goals quicker. There you have it, 7 healthy promises to yourself that you can actually keep. If you feel like you’d have trouble keeping these promises, no sweat. Apply for my online “New Year, New You” Challenge Fit Club and I’ll be “by your side” every step of the way as we get you from where you are today to the body that you want to live in tomorrow.